Cutera XEO Platform | Covers Popular Aesthetic Treatments | LOW PRICES!! The Cutera Xeo platform is perhaps the most versatile and adaptive all-in-one aesthetic platform on the market today. 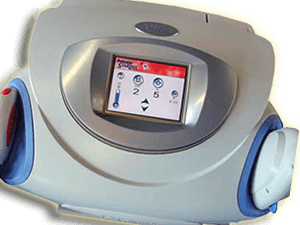 Offering a great deal of flexibility with multiple handpiece options, the Xeo also offers combination treatments to meet customer demand and provide a larger treatment selection than any individual standalone console could attempt. Also, with the addition of truPulse technology, the Cutera Xeo is able to provide consistent, sustained energy for maximum results in all treatment areas. Nd:YAG Laser – Known as Cutera’s signature wavelength option, Xeo’s Nd:YAG Laser handpiece can treat spot sizes anywhere from 3 to 10 mm. The handpiece can safely be used on all skin types for hair removal, pigmentation and vascular lesions, skin revitilization, and wrinkle removal. 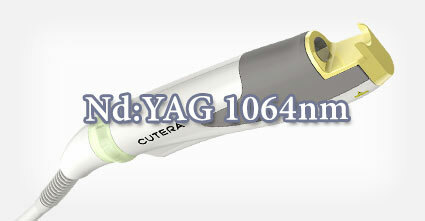 Additionally, the Nd:YAG Laser handpiece can be used for Cutera’s signature laser genesis procedure. Limelight – Using IPL technology, the Limelight can be used on Fitzpatrick skin types I – IV for pigmentation, vascular lesions, and skin revitilization. The handpiece will treat spot sizes up to 10 x 30 mm. Used in conjunction with Xeo’s laser genesis treatment, the Limelight can diminish brown spots, redness, and scars in a non-invasive combination procedure. 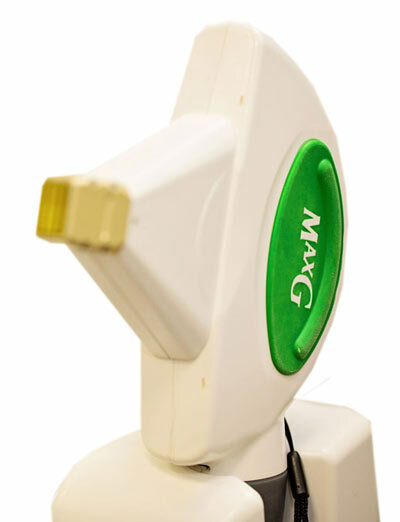 Prowave LX – The Prowave is an identical counterpart to the Limelight in all ways except that the intended treatment is hair removal rather than skin imperfections. Titan – The Titan is specifically targeted towards deep dermal heating with a spot size range of 10 x 15 to 10 x 30 mm. Like its fellow IPL handpieces, the Titan is safe for Fitzpatrick skin types I – IV and can reduce many signs of aging (facial redness, pigmented lesions, and wrinkles) when used in conjunction with the Limelight handpiece and Xeo’s laser genesis treatment. Acutip – Used for treatment of pigmentation and vascular lesions, the Acutip is a precision-driven handpiece that offers lower fluence and a smaller spot size of 6.35 mm for intricate work on fine lines, wrinkles, and skin imperfections. Pearl & Pearl Fractional – Designed for skin resurfacing and wrinkle removal safe for Fitzpatrick skin types I – III, the Pearl and Pearl Fractional handpieces offer a unique laser wavelength that is optimized for coagulation and ablation of a 6mm or less spot size. Used together, the two succeed in eliminating deep-set wrinkles as well as photodamage done to the skin. For more in depth information on the XEO Laser System, visit their website.